Proprioceptive neuromuscular facilitation is a pre-contraction stretching which involves contracting the muscle that is being stretched or its antagonist (opposite) before stretching. Typically, this is done in clinics by a therapist, however, you can do PNF neck stretching at home. Although there are various techniques, most contract and relax or hold and relax techniques suggest 75-100% of maximum contraction, studies show that 20-60% is just as effective. 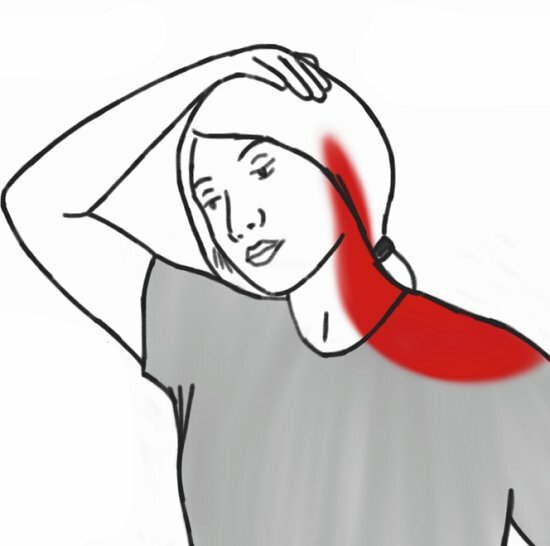 The increase in motion range is often seen on both sides, indicating a possible neurological relationship, and making it optimal for the neck. Contracting at lower forces is also more appropriate for painful conditions. Nonetheless, if you have pre-conditions, you should check with your health care provider first. Basically, you can stretch in the ranges of motion; forward, backward, left/right rotation, and left/right side bending. If you are doing rotation, turn your head to the right as far as you can without increasing pain. You can place the palm of your right hand on your forehead to resist turning your head back to a straight position for 5-10 seconds. Then relax the stretch with no resistance for 15-20 seconds. This can be repeated three times, then you can do the other side. After the first stretch, see if you can turn your head a little further than the first time. 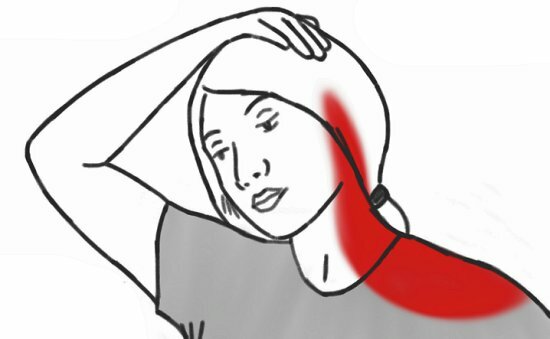 Obviously, if you have a pinched nerve in your neck, one side will be more painful to turn or tilt than the other. Only do the non-painful side, and only with light pressure. Remember, this will have an effect on the opposite side without stressing it. This is also the basic idea in our progression of chin tuck neck exercises to reduce pain, where you are using no resistance at first, then resistance against gravity, then resistance against a ball. So as you progress, you can gradually increase resistance as your pain levels decrease. Different types of stretching are all an effective way to increase flexibility; however, different stretches may have varying effects on different individuals. So, this is another method of stretching that may or may not work for you or your particular condition, as stretching programs often need to be individualized. This involves some trial and error, so it is always good to start slow. The less flexible, the longer you may need to hold the stretch. Know when to stretch. If you have a contracture, any stretching will probably not help. Contractures and problems with joints like a facet joint injury after whiplash, may not respond to stretching because the problem is with structures like joint capsules or ligaments that do not stretch or have no contractile properties. So, the tightness you feel on motion may not be a muscular problem. Or, there may be adhesions in the muscle that stretching will not overcome and just cause further irritation. This relates to better diagnosis – better treatment. PNF neck stretching is a quick method to increase flexibility. The key is the resistance where you contract the muscles first. This is an isometric contraction, where the muscle contracts without moving. Remember, mild contraction forces are as effective as harder ones. For your neck, the resistance of your hand is enough. You can also use a ball or a towel against a wall. You do not want the muscle to move where it moves your head – this is an eccentric or concentric contraction as in weight lifting or typical stretching where your head moves the muscle through a range of motion involving the joints. A 2017 study in the Journal of Back and Musculoskelet Rehabilitation found that PNF neck stretching was more effective than manual therapy for increasing function in daily activities as well as reducing pain in subjects with cervical spine osteoarthritis. The reduction in frequency and intensity of neck pain was noted in the short and long term. A 2013 study in the Journal of Physical Therapy Science concluded that the application of PNF techniques are effective for myofacial pain subjects at improving function. A 2009 study in Kaohsiung Journal of Medical Sciences found thet PNF stretching was more effective than regular or static stretching for patients with knee osteoarthritis. A 2012 extensive review in the International Journal of Sports Physical Therapy concluded that PNF stretching may be more effective for immediate gains in range of motion than other forms of stretching. There are indications that PNF stretching may reduce pain and increase function in some individuals. If your normal stretching is not producing the results you would like, this may be a good method to try. It can be added to other conservative measures to combat neck pain from postural stress to injury recovery.